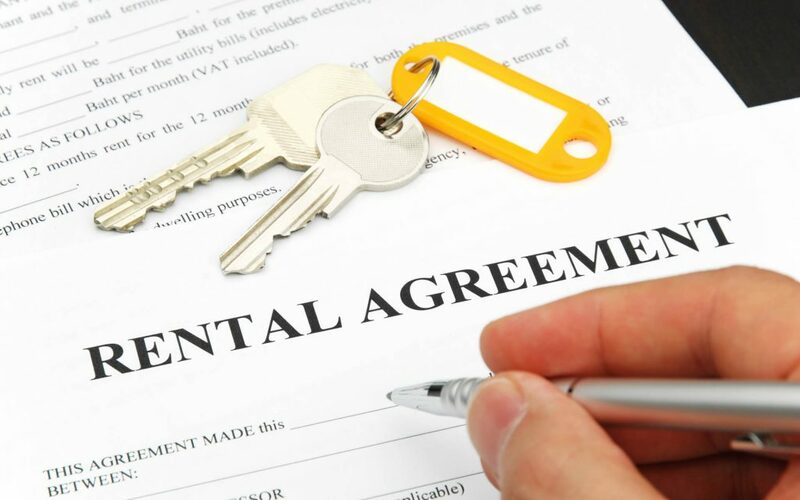 When you rent property, you’ll be signing a formal lease, which is a legal agreement between you and your landlord. Because most leases are form agreements, you should be able to prepare for your review of the lease your landlord will provide. A lease is a formal legal agreement that sets out your obligations to the landlord, and your occupancy rights in your new home. Accordingly, you should make sure to review your lease carefully, and if you are confused about something or concerned about a term you should consult with an attorney. Leases do not necessarily need to be in writing, but most landlords will require a written lease that sets out the rights and obligations of both parties. Most non-professional landlords use some sort of form lease that is available for sale online or in office supply stores, but professional landlords might have their own lease that they have written themselves. In either case, most leases have fairly common terms in them to address your legal rights and obligations, so it would be helpful to familiarize yourself with the major common issues. Here are some common lease terms, more or less in the order in which they are generally presented in standard lease forms. The lease should formally state that the landlord is giving you the right to lease the premises, and you’re accepting the premises. This can be as simple as “Landlord agrees to let, and Tenant (Lessee) agrees to take” or can be more formal. Technically, this is called the “demising clause,” but it really just sets out the basic agreement that you will be leasing property from the landlord. The lease should clearly indicate what property you are leasing. A street name description is fine. You should just check that you are signing a lease for the correct property, including the unit number for a condo or apartment. The lease should identify the term of the lease. Most written leases are for a fixed period of time, usually set out in yearly increments: a one-year lease, a two-year lease, etc. Essentially, you have the legal right to occupy those premises during that period of time. Some leases will contain a provision allowing for your right to renew at the end of your lease, either at the same rental terms or perhaps for a slight increase in the monthly rent. Usually, the term will require you to give notice of as much as three months’ before the end of your lease, to give your landlord time to find a new tenant. If you exercise the right to renew by giving that formal notice (usually a letter to the landlord), you can get another full term. Even if you don’t exercise the renewal right, or if your lease does not have a right to renew, you can always negotiate with your landlord for a new term. The lease should specify who is responsible for the utilities. In most cases, you will be responsible for cable bills, electricity, and perhaps heating. It’s often difficult for the landlord to assign responsibility for water usage, so water might be included within your general rent payment. Whatever the case, you should be aware of whether you will have utility obligations. If so, you might want to see some utility bills for the property to get a sense of how much prior tenants have spent for electricity and heating. The lease should state what the rent is and how you are supposed to pay it. The lease will probably state that you need to pay the rent for the month in advance, often at the beginning of the month. Most leases are paid monthly, with the monthly rent amount fixed through the term of the lease. The lease might also contain some sort of penalty if you pay the rent late. A penalty clause is not unreasonable so long as it is within 10% of the actual rent payment; anything more than that is unusual and could be challenged. Usually, landlords will require the first month’s rent in advance. It’s also common for the landlord to collect both the first month’s rent and the final month’s rent in advance, in order to protect against tenants who decide to withhold the last month’s rent in order to force the landlord to use the security deposit to cover it. Landlords try to avoid that situation, because they need the deposit to cover damage to the property, so they get the last month’s rent in advance to ensure that it gets paid. Most leases will put the duty of repair on the landlord, at least for major appliance repairs and items such as the plumbing, electrical, heating, and roof integrity. It generally should not be the tenant’s responsibility to cover basic repairs and maintenance, at least not in a one-year term, unless the tenant abuses the property and causes the problem. You should carefully review your lease to see whether you have an obligation to maintain basic systems beyond using an ordinary standard of care allowing for normal wear-and-tear. If you do have a significant repair obligation, you might consider negotiating on that point. Most leases give the landlord a limited right of entry on the premises to make repairs, show the property to new tenants during the final months of the lease if you’re planning on leaving, or in cases of emergency. Remember that a leasehold is a legally significant property interest that you have – when you rent the property, you get the right to live in the property, and the landlord loses that right. Generally, the landlord should not be allowed onto the property unless you request it, repairs are needed, or the landlord has some urgency. Unless there is an emergency, your lease should allow for fair notice if the landlord is going to enter the premises. After all, during the lease, it’s your property. Your lease might have a term requiring you to give the landlord (or real estate agents) entry during the final several months of the lease for the limited purpose of showing the property to prospective tenants who will take over when your lease ends. This is not an unreasonable request, but you are entitled to advance notice of any showings, and to be present at showings. The lease might specify your rights to have pets on the premises: allowing for pets, forbidding all pets, or allowing certain types of pets but not others. If having a pet is important to you, you should pay careful attention to any language in the lease relating to pets. Moreover, that’s something you should make clear to your agent when you start looking, because landlords forbidding pets will usually make that stipulation when they put properties on the market. The lease might specify whether the landlord has an obligation to deliver the premises on time. Sometimes, a landlord will sign a lease with a new tenant, then find that the old tenant has not yet vacated. You should require in your lease that payment will not be made until delivery of the premises is ready, which means that the premises are cleared out of other tenants, and broom-swept clean. You should not sign a lease that disclaims any obligation of the landlord to provide for delivery of the premises. It should the landlord’s responsibility, not yours, to free up the space. Most leases will provide for a security deposit to provide for payment in the event of damage to the premises, usually one or two months’ rent. What most tenants don’t know is that the landlord is required to hold your security deposit in a special escrow account, rather than commingling it with all the landlord’s other funds. Indeed, if you are renting in a building with more than six units, the landlord is required to notify you where the money is going to be escrowed. You should pay careful attention to any language indicating what the security deposit can be applied to. It should be limited to damage to the property or unpaid rent, but sometimes leases can allow for a more expansive right for the landlord to keep the deposit. A “sublet” is a lease between the tenant and a new tenant. In a sublease, you as the tenant essentially become the “quasi-landlord” for your tenant, although you remain subject to all the obligations of your lease with the real landlord. This is different from an “assignment,” in which you literally give your rights and obligations to a new tenant, who becomes the actual tenant for the landlord and leaves you free from the lease obligations. Most leases will have language governing the right to sublet or assign, if only because if the lease fails to address the issue you automatically by operation of law get an unfettered right to sublet or assign. Usually, if the lease addresses the issue, it will give you a limited right to sublet or assign the space to a new tenant so long as you give notice to the landlord and get the landlord’s consent. In a residential lease, the landlord must give consent if your sublet/assignment tenant is a reasonable substitute for you. Although leases do not have to be in writing, or be signed, your lease will probably be signed as a matter of good practice. You don’t generally need notarized signatures.